It may be autumn, usually the season for warming soups and hearty meals, but why can't a salad be both warming and hearty? 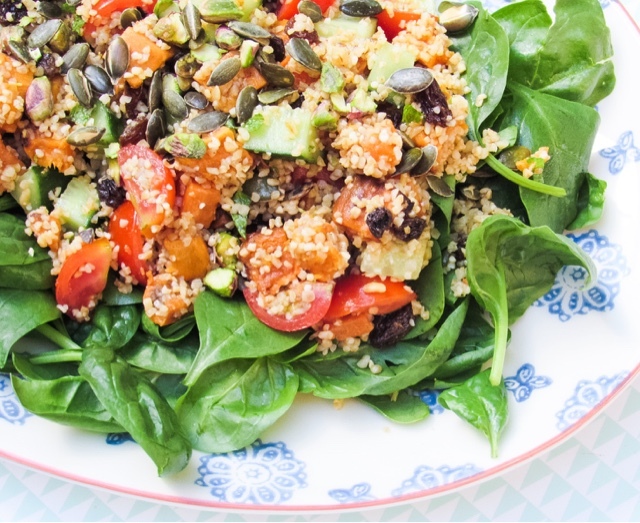 A lot of people are trying to eat healthily at this time of year and this salad makes a delicious lunch on-the-go or flavourful dinner. 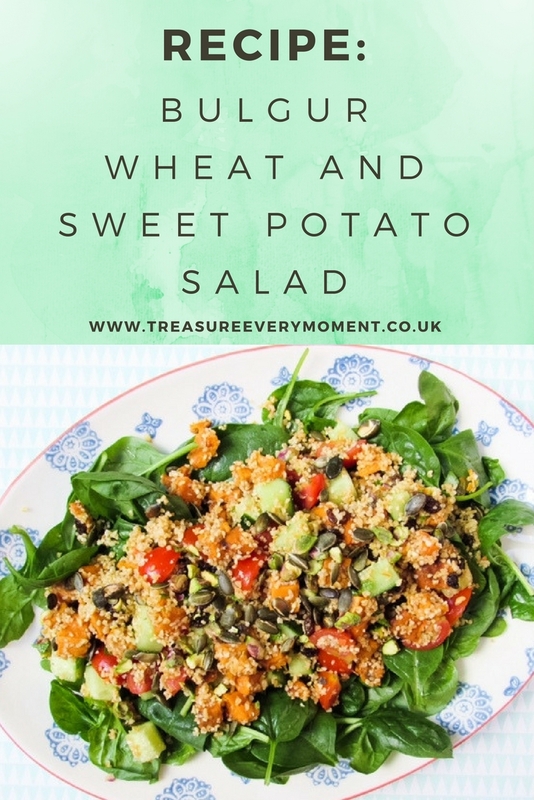 I like eating this salad while the bulgur wheat and sweet potato are still slightly warm, as it feels so much more comforting. Though if you're having this on-the-go you probably want to wait until they're cooled because they'll wilt the spinach leaves otherwise. There are a variety of textures, flavours and the warming cumin adds a delicious twist. 1) Preheat the oven to 190'C. Place the diced sweet potato onto a baking tray with a dash of olive oil and 2 tsp cumin. Bake for 30-40 minutes or until cooked through and slightly browned. 2) Follow the instructions on the bulgur wheat you have. For mine I added boiled water and a stock cube to a bowl with the bulgur wheat. Then covered and left to 'cook' for 15-20 minutes. Drain any excess water and set aside. 3) To make the salad combine the cooled sweet potato, bulgur wheat, sultanas, fresh mint, cherry tomatoes and pistachios. 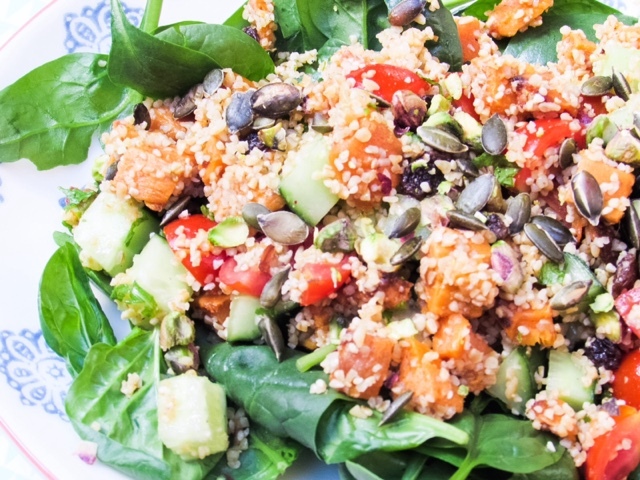 4) Place the spinach leaves onto a plate, sprinkle over the diced cucumber and spoon on the bulgur wheat salad. Sprinkle with pumpkin seeds, drizzle with olive oil and serve. I'm a BIG salad fan so this looks a lovely meal to me. Going to give making this a go at the weekend. Always looking for more salad idea, this one looks delicious and packed with flavour and textures. I've never tried bulgar wheat before! It looks really tasty as part of this dish, Id love to try it!! Ooooh I love anything with sweet potato in it and this looks like a lovely healthy and nutritious meal. That looks so fresh and healthy, love it. Oh yum yum, this looks lovely and great lunch for me. Off to Pin! Ohhh, this looks so yummy! Can I order one for lunch please?! I will definitely be giving this one a go! That sounds so lovely! The perfect Autumn salad. I'll have to try this soon!